Students enjoy doing sustained choice writing of any form, growing as writers while teachers come alongside to provide just-in-time instruction to meet their individual needs. Lessons specific to the success of independent writing are taught ahead of the launch. Select a topic below to browse supportive resources. 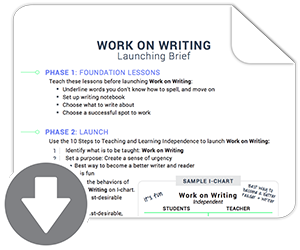 This one-page guide will help you remember what foundation lessons to teach before launching Work on Writing and what essential behaviors need to be placed on the I-chart.